Oh Jon & Samantha… You had my heart on the day we first met. The day where no place was open for a meeting and it was FREEZING outside! Your easy going personality as we went from place to place unloading and loading the kids back up… Until finally we decided on Starbucks. You had my heart! After our Starbucks date we got in the car and I turned to Luke and told him Jon & Samantha represent exactly who we want as a couple. Friendly, laid back, and completely in love with one another. Best Friends and just totally meant to be. For their engagement session we met them at First Landing State Park. I have heard many great things about this place but since we live on the Peninsula I have yet to make it out that way. We were definitely not disappointed by the scenery. Jon & Samantha LOVE the beach. I think sand and salty air is in their blood. And so it was natural to get some shots of the two of them on the beach and near the water. Luke & I loved walking around with them getting to know them better. They are so easy to talk to and are up for anything! I love that about them! Jon & Samantha will be tying the knot on 10-10-15. Literally the biggest wedding day of the year! 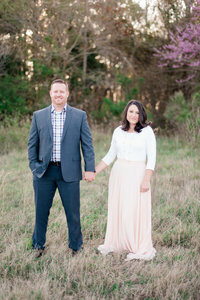 We have had so many inquiries for that date… And I am beyond thrilled that we got Jon & Samantha! Cannot wait for their wedding day! Enjoy their session, there were so many good ones of these two!!! Samantha had this GORGEOUS necklace that we had to get a ring shot with! These two are the greatest at walking and laughing! Beautiful!! 🙂 Love how you got a sunset one too!